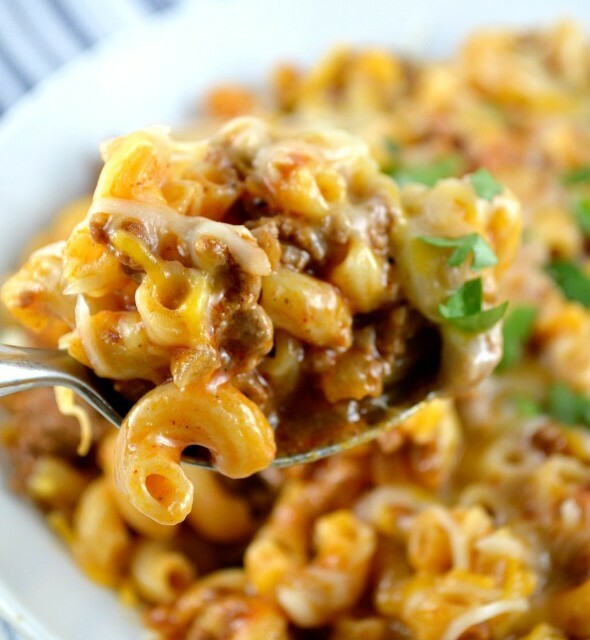 One Skillet Cheesy Chili Mac! Delicious, cheesy and gooey. 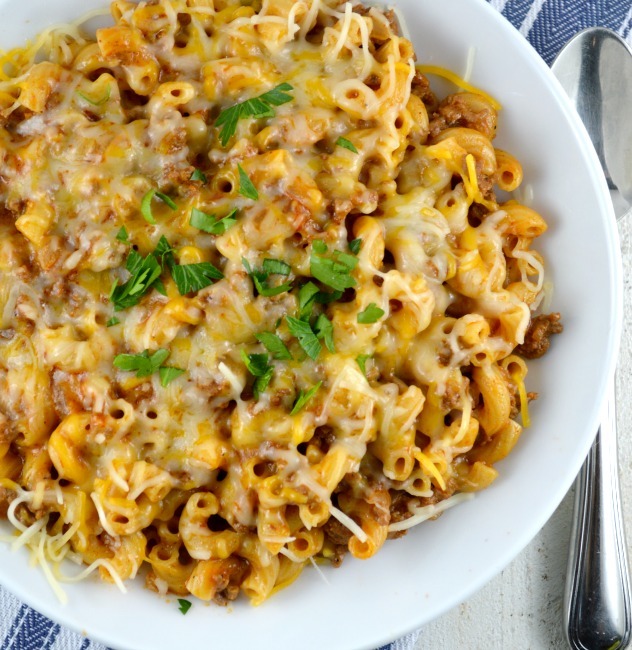 Perfectly cooked pasta, meaty chili loaded with cheese all made together in ONE PAN! This recipe for One-Skillet Cheesy Chili Mac is really, really, really, a dream come true! Three reallys? Yes, three really! Delicious pasta, yummy meaty chili, and gooey cheese. All made in one skillet? No separate huge pot to boil the pasta. No colander. Easy clean-up? Prepackaged shredded Mexican blend cheese is even preferred over buying cheese and shredding it yourself. But sometimes it’s nice to have a little convenient! Okay, so who cares about all that if it’s not super yummy? Well, no fears! Of course, this is super yummy! Come on, you know it wouldn’t be on my blog if it wasn’t a winner! I mean, even if this recipe wasn’t easy and convenient, I’d be making it just for it’s “delicious factor” alone! This has become one of the recipes that’s gone right to the top of the dinner rotation. In a 12 inch nonstick skillet, add oil and heat until it's shimmering. Add onion, chili powder, cumin and 1/2 teaspoon salt. Cook over medium heat until onion is soft, stirring often so spices don't burn, about 5-7 minutes. Add the garlic and brown sugar and cook, continuing to stir, so garlic doesn't burn, for about 30 seconds. Add the ground beef and brown lightly, breaking it apart with a wooden spoon as it cooks, until there is no pinker in the meat. Add the water, 3/4 teaspoon salt and tomato sauce to the skillet and stir to mix. Stir in the pasta and cover, increasing the heat to medium-high. Cook the mixture, stirring often and adjusting the heat to maintain a vigorous simmer. Continue to cook until the pasta is tender, about 9-12 minutes. Take the skillet off the heat and add 1 cup of the cheese mixture. Taste for seasoning and add salt and pepper to taste. Top the skillet with remaining cheese and rest the mixture off the heat a few minutes or until cheese melts. Sprinkle with chopped parsley. Serve. Cheese: You can use any cheese you like in this recipe, but the Mexican cheese blend that comes already shredded is preferred. The combination of cheeses helps bind the mixture together, add a bit of creaminess and, of course, gives the dish that delicious cheesy goodness we all love and expect! Pasta: I used Barilla Elbow pasta and measured out 2 cups. I measured it in a dry measuring cup and it was pretty much level. There may have been a few elbows that poked just above the line of level, but it’s not like flour and you can easily level it off perfectly. You don’t want to measure a heaping cup because it will affect the amount of water you need. It worked out great! Toasting The Spices: Don’t forget to add the spices while you’re cooking the onion. Doing it at this point reduces the harshness of the chili powder. Generally, when you’re making a big pot of chili, you don’t need to do this because you cook the chili for quite a bit longer than this dish is cooked. The longer cooking process does the same thing. Make It Spicy: If you want to spice this dish up, add some red chili flakes when you add the chili powder. My family is “heat adverse” so I make it as I’ve written it below :). Amazing! The only modification I made was that I used gluten free elbow macaroni and it was perfect. My husband loves these types of concoctions so it was right up our alley! I would love to try this recipe. How much is considered as serving? I am doing weight watchers program. It was really good!.. I really enjoyed this recipe and I’m a bit of a foodie… just plain good and comforting!.. Best recipe off americas test kitchen. My family and I are VERY excited to try this tonight! If we love it, I’ll be sure to share your recipe link on our blog’s page! 😉 Pretty sure it’s going to be a WIN! BTW, I’m wondering what plugin you use for printing your recipes? It appears super simple, and I’m looking for that for my own recipes on the blog. We made this tonight, and it was DELICIOUS! My husband rarely comments on meals, even when he likes them. He must have complimented this dish three or four times! Thanks for sharing it! Hi Haley. So glad you guys enjoyed the Cheesy Chili Mac! Made this for supper tonight and it was really good! I used Colby jack cheese and added some taco seasoning in addition to the chili powder and cumin. Thought it was interesting to cook the onion with the spices and it did have a nice flavor. Love that it was a one pot recipe! This was great! Definitely a keeper and in the meal rotation now. Made this tonight – yum! I was out of lettuce to make a salad to go with it, so I just threw some frozen corn in with it while the pasta was cooking and it turned out great. Didn’t realize I was out of macaroni noodles until I was making it, so subbed with rotini. Will definitely be making again. Thanks for posting! Hi Liz. So glad to hear you liked the recipe. Rotini sounds perfect! Hi Marilyn. So glad you liked the recipe. Yes, I find it’s very forgiving and easily customized. Love the ancho chili powder. The plan was to make this for the family since I don’t eat cheese. Before I added the cheese, I took a taste and oh my goodness….. had to have a second bowl. It’s delicious without the cheese. I can only imagine how it is with the cheese. Awesome recipe! I ran out of ideas as to what to do with ground turkey and thanks to pinterest found this website. Dinner was amazing! I added some sour cream to help balance the spice and it to make it super creamy. I love one pot/pan recipes so thank you!!!! This is a favorite dish of my husband and since I’m a lazy cook, i’ll tackle it. Going to use buffalo for the meat. Think he will notice :-). Looks yummy! This was super tasty! We also modified a bit, using an above commenter’s suggestion of adding a can of black beans, then also added a small can of diced green chiles. Next time, I plan to chop up some fresh tomatoes and throw that in, too. Thanks for sharing! Excellent! My boy has celiac disease so I made it with gluten free corn macaroni noodles (and had ground turkey only on hand so was a little worried) but it was amazing! Thank you so much for this quick and delicious recipe! Hey there! Made this tonight with the meat from half of a left over rotissare chicken we had for dinner yeaterday! We loved it!!!! Just finished making this for my family and they LOVED it. My 2 yr old ate 2 bowls. I doubled the recipe due to having a lot of mouths to feed. Turned out awesome. I will definitely be making this again. I made this tonight and both my husband and I loved it. I have been searching for one skillet meals for both lunches and dinners during the work week and this is definitely a keeper we will be coming back to often. The only change I made was to use ground turkey – other than that I followed the recipe exactly. My next try will be your goulash and can’t wait!! Hey Valerie. So glad you enjoyed! I love skillet meals. They make dinner enjoyable rather than a chore! This is my second time making this chili Mac. My family loves it, especially my 4 children. I didn’t use the Mexican mix of cheese. I have used cheddar, and Monterey Jack both times, and because of the spices, it comes out tasty! Thanks again, and keep up the good work. Your blog is one that I come to for recipes. Hi Eugenia. Thank you so much! Honestly, that is so very nice to hear. Hi Kathleen, my husband and I are non-onion eaters. Do you have any recommendations for cooking this recipe without the onions? Hi Joelle. Great question! Onions are such a foundational flavor ingredient that honestly omitting them is tough for me! Do you eat shallots or leeks? I know they’re from the same family as onions, so they may be out for you as well, but if you do eat them, they would be perfect to add instead of the onions. I made this tonight and it was excellent! Since I used my stainless skillet my noodles stuck a little but other than that, I followed your recipe and it was delish. Thanks for sharing! This looks so good! My husband and I are not spending any money this month (besides gas for our cars and bills), so I actually think I can make this with things I already have in my pantry and freezer. Although, we usually like to have leftovers for work, etc., do you know if it would be too much pasta if I were to add a 16 oz. box to the skillet? Thanks for any help you can provide! Hi Michelle. Yes I think it would definitely be too much pasta. I think it would throw off the sauce to pasta ratio and be dry and not very flavorful. Sorry! Hope that helps! Made this on a whim tonight b/c I had some ground turkey to use and it was delish! The flavors work very well together! Hi Kristin. So glad you liked this recipe 🙂 I think it’s really delish as well! Wow, this is so good! I used ground lean turkey and whole wheat noodles..added a little extra cumin and chili powder. My entire family loved it. I cannot believe how easy and delicious this was. My new favorite recipe. Thank you so much for sharing such a delicious recipe. We had it for dinner tonight and I couldn’t get enough of it! I love using cumin and its a great anti-inflammatory spice too. Your dish looks amazing but I’m always sad to see bloggers who encourage the use of pre-shredded cheeses. If you look in a bag of shredded cheese you can see the powdery white stuff clinging to the cheese itself and gathered at the bottom of the bag. This is cellulose. MOST of them contain cellulose, which comes from wood pulp and is used to keep the product from clumping together, repels moisture and lowers fat content as it will naturally absorb some from the cheese. I don’t know about you but that’s just not appealing. A 2 cup bag of pre-shredded is actually MORE expensive versus an 8 ounce bar of cheese. (unless you’re doing coupons or they have a sale) A bar of cheese also will last longer in your fridge since it has less surface exposed to the air to encourage mold. So yeah, you’re doing some grating but you’re not eating wood fibers either. Hi Yosephine! So glad you enjoyed this! It’s on my go-to list as well! My fam LOVES this recipe! I made this last night and we loved it! I will make this over and over! And very easy to throw together. made this last night for dinner and it was delicious! I added 1 can of black beans and used turkey meat. thanks for the recipe! Hey Jen. So glad you enjoyed. I love your changes and additions! I tried this last night for dinner and you are right, my son (who is 3) ate seconds. He even wanted a 3rd, but I had to cut him off. 🙂 I initially was worried about the Tablespoon of cumin and chili powder, but it was the perfect amount of spice. Thank you for the recipe. Hi Ava! Thank you for your comment! Love that your 3 year old enjoyed it!!! Wonderful recipe — so much flavor! Perfect work week meal. I got home at 6:30pm and by 7:30pm we sat down to eat. Thank you so much for sharing! I look forward to trying other recipes in the future. This looks delicious and I’m ready to try it but I’m confused about your pasta measurement. You ask for 8 ounces or 2 cups of pasta. 8 ounces is one cup so is it 1 cup or 2 cups of pasta? Thanks. When I measured out 8 ounces of dried elbow pasta it measured out as about 2 cups(dry measuring cup not liquid cups) of pasta. Because of the shape and volume its different than something liquid or solid. It has to do with 8 oz of weight vs. 8 oz volume. Somewhere, with some substance (probably water), I’m sure they are the same, but not all things are the same density so usually they don’t match. For instance, 8 fluid oz (in a wet cup) of water would weigh less on a scale than the same cup full of sugar (or salt…or rocks). Pasta is measured by weight on the package so 8 scale ounces of noodles fills about 2 cups. Would this freeze well? It’s just me and I would like to try it and freeze in individual servings. Hey Ada. Well, it will definitely freeze but the pasta texture will change quite a bit. It gets mushy. Honestly, a lot of people object to the texture. I happen to not mind it at all and freeze recipes like this all the time and thoroughly enjoy them. So……it’s up to your preferences! So glad you liked it Terry! I used ground turkey instead of beef in this recipe tonight. It was absolutely delicious! My husband and son (both picky eaters) devoured their servings. I loved how the ground turkey felt like it melted in my mouth from simmering so long. Thanks for the recipe! Hi Jennifer. So glsd it was a hit in your house! Kathleen, made it tonight. It was delicious, added a little cayenne cause being from Louisiana we like the spices! Hey Cathi so glad to hear you like it! Thanks for taking the time to report your results! Thank you so much for your quick response, I really appreciate it. I will be making it in a couple hours! I loved your goulash so I thought I’d try this. I had some reservations about serving it to my husband, who claims not to like anything “Mexican”, and thinks cumin smells like….well I won’t tell you what he thinks it smells like because I’m a lady LOL. So I was amazed when he said it was “very good – not too spicy” and to “make it again”. Whoohoo! That’s 2 for 2 – next on my list is your Pasta e Fagioli soup – as soon as the weather cools down. Hi there Marianne! So glad both you and your hubby are pleased! I’m excited your going to try the Pasta e Fagioli soup. We really love it. Just make sure you use a low sodium broth because so many of the ingredients in the soup already contain salt that soup could be too salty otherwise! Hope you enjoy and thanks so much for your comment! Thanks for confirming Kathleen. I will try it soon. You’re so welcome, Laura ;)! It looks yummy but are you sure that it is supposed to be Tablespoons, teaspoons on the chili powder and cumin? That seems like a lot for 1 lb of meat. This looks so yummy! Can’t wait to make it. Thanks so much Susan. Enjoy! Oh my goodness Kathleen. This is just the kind of dish I love. And you don’t even have to buy a taco kit or one of those “helpers” to make it. Love your blog. Delicious, yummy and gooey? Exactly what my sons want all the time. Can’t wait to make them this! Bacillary pasta product of USA, my Doctor tells me if I have to eat pasta to buy a pasta made in Itally since domestic flour is no good for health reasons. I always use DeCecco, it’s made in Italy. Braille is Italy’s best selling pasta made in USA. This recipe was originally adapted from Cook’s Illustrated Best Skillet Recipe cookbook, and is a favorite go to for a quick meal especially on ski trips. I like to use leftovers the next morning and hash it up with eggs. Tastes even better!